Well, the wedding bells have stopped ringing, the cake has been eaten, vows exchanged, the bouqet has been tossed (which, by the way I caught ), and I am happy to report there were no wardrobe malfunctions! This is a picture here of me in the dress that almost had me breaking out into hives. 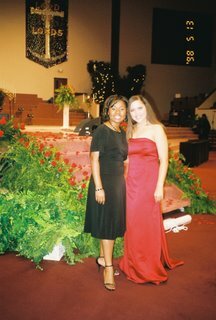 My friend with me is Natasha who sang a beautiful trio in the wedding. It's hard to believe the wedding is over. Where does the time go? It just seems like yesterday my two friends Jonathan and Kanika were engaged, and now they are husband and wife forever. It truly was a beautiful, meaningful wedding. Now they are on their way to their honeymoon destination! We got a chance on Friday after the dinner rehearsal to reflect upon the biblical meaning of marriage. I must say, that is some deep stuff there. Just think about it: marriage was the first institution created by God, and it is the longest lasting institution! Adam and Eve were the first family of creation, and God has been uniting men and women together ever since! Wow! In the New Testament believers are shown as the Bride of Christ, whom Christ will return to receive for Himself. So, if you are single you are already a bride! A marriage between a man and a woman is a physical representation of Christ's love for believers. So that means the world should be able to look at Christian marriage and see how God loves us! I wonder if that is what the world sees when it looks at Christian marriage? This weekend I was brought to tears as I was reminded of what GREAT love the Father has for His Bride--the Body of Christ. It truly is amazing love; a love no one can comprehend. However, I desire to better understand it, and to better give it, and exemplify it for others. I cannot say I have ever been to a wedding that left me pondering about God's love for me and gave me a desire to know Him even more. It truly was a worshipful experience because when I think about the great love the Lord has for me, it produces a grateful heart, and in return leads me to want to worship! So, despite all of the drama leading up to the wedding in regard to the dress, God blessed my heart tremendously by showing me the bigger picture. It's not about the dress, the flowers, or the reception. Christian weddings are a commencement of two lives joining together as one, to manifest the beauty of Christ's love.